Saving Advice is a community built around the notion that saving money is good. We offer free articles and information on all aspects of personal finance including debt reduction, how to save money, how to make money and how to invest. If you need any money saving advice, you have found the right place. How Much is Too Much In Your Sinking Funds? How much do you keep in your checking account? 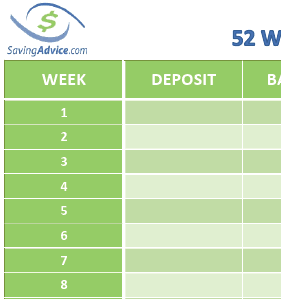 Try out the 52 Week Savings Challenge for an easy way for any family to save over $1300.